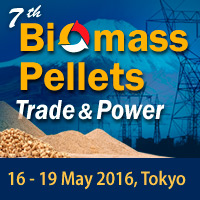 CMT’s 7th Biomass Pellets Trade & Power on May 16-19, spotlights — Japan’s fast expanding biomass power market; and pellet trade with Southeast Asia, USA and Canada. Focused discussions at the summit include Japan’s electricity market reforms; South Korea's RPS, biomass demand outlook and China's biomass utilization. Sumitomo unveils the ‘Biomass Opportunities in Japan's Electricity Generation & FIT System’ – post Fukushima. Focused discussions include Japan’s electricity market reforms; South Korea's RPS, biomass demand outlook; China curbing coal emissions and increasing biomass utilization; biomass supplies into China, Japan and Korea as well as insights on biomass and wood pellet prices, challenges of biomass co-firing and intricacies of biomass project partnerships. Among key speakers are senior reps from CREIA, Jiangsu Muyang, Bloomberg New Energy Finance, EnerOne, Indufor, PVM Oil Associates, ECN, TAKEEI Corporation, Lantern Advisory & Investments and RWE Generation. New this year is a Breakfast Talk on ‘Solid Biomass Fuel Characteristics & Sourcing Considerations’ by FutureMetrics and WPAC. A pre-conference workshop on ‘Black Pellets’ facilitated by ECN and RWE Generation as well as a post-conference site visit to Soma Kyodo’s Shinchi Power Plant are arranged. Organized by Centre for Management Technology (CMT), the event has Wood Pellet Association of Canada (WPAC) and Sumitomo Corp as Corporate Sponsors and exhibitors – Vermeer, KAHL, Rainbow Pellets & Briquettes, An Viet Phat Energy, Beijing Panda Pellet Machinery, EnerOne, Muyang, Sanyo-Trading, TSI and American Biocarbon. For more information, visit event website or contact Ms. Hafizah at +65 6346 9218.